Professional and opportunistic criminals are systematically targeting Britain’s farms, according to the leading rural insurer NFU Mutual. The NFU’s rural crime survey reports that 62% of Mutual branches have seen an increase in rural crime in their area. Some 59% of branches say rural crime is most likely to be committed between midnight and 6am. The result is a 17% rise in the cost of ‘rural crime’ over the last two years. The survey, based on the claims experience of branches across the UK, reveals an increased demand for high priced items that are portable and easy to sell on. The theft of power tools such as chainsaws, electric drills and lawnmowers has topped the most stolen items list, with quad bikes, telescopic handlers and tractors also on the thieves ‘shopping list’. When asked about the main reason thieves target the countryside, 41% of respondents cited the difficulty of policing rural areas, 32% said thieves were less at risk than in urban areas, and 23% thought relaxed attitudes, by famers, towards security could also be a factor. Gloucester NFU has joined forces with Gloucestershire police, Datatag and leading agricultural insurer NFU Mutual to encourage the Gloucestershire farming community to proactively protect their equipment and install the CESAR Security system. In an innovative move Gloucestershire, farmers will be able to have CESAR fitted at a discount until the end of June 2012. 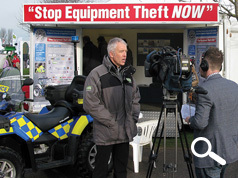 The recent Gloucestershire Rural Crime Conference, which was attended by top police officers and the farming community, kicked the scheme off which is now receiving wide publicity in and around the large rural community in Gloucestershire. Datatag systems and CESAR work as a powerful deterrent against theft and an invaluable aid in recovery. Datatag security systems are available for all types of equipment from a laptop computer or electric drill, including 4x4 vehicles and trailers, up to the largest tractors or combines. Datatag security marking gives each piece of equipment a unique ‘fingerprint’ using an array of high technology security marking devices including tamper evident triangular registrations plates (with a unique registration number for each machine) Radio-frequency identification (RFID) transponders, forensic liquid DNA, and microscopic Datadots®. NFU Mutual give insurance premium discounts of up to 12.5% for equipment protected by CESAR. Leading manufacturers including John Deere, New Holland, Zetor, McCormick, JCB and Manitou fit CESAR as standard but any existing piece of equipment can be fitted with a Datatag or CESAR security system ‘in the field’ by a network of fully trained and CRB checked installers. 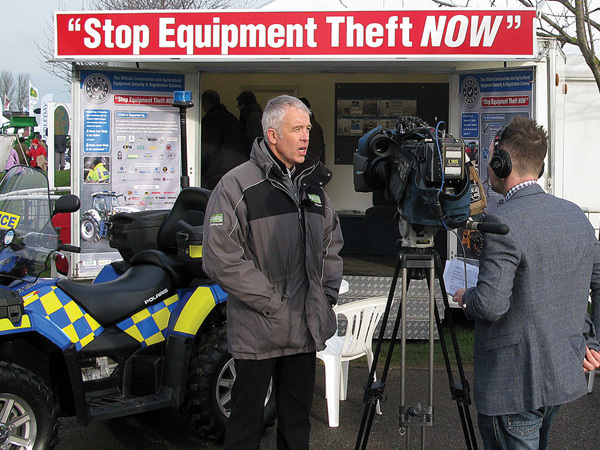 BBC East Midlands highlighted the rural crime wave, with a report from the recent LAMMA show, which featured CESAR as a sensible and cost effective security solution. See the web site at www.cesarscheme.org for more details.